We have had precious little snow in the Sierra this winter. While this is a big bummer for skiing and photographs of snowy landscapes; the unusual weather conditions do allow for some different winter landscapes than I normally shoot this time of the year. Many of the creeks in the area are frozen, which creates opportunities for some photographs using ice as part of the composition. 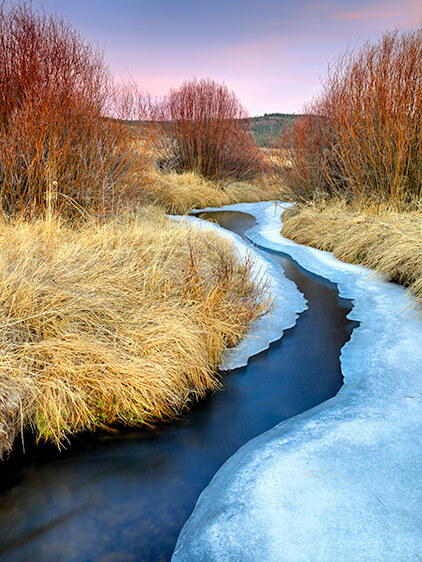 Martis Valley is full of wonderful brown and red toned vegetation which contrasts nicely with the ice in the Martis Creek. Even though we have no snow it is still worth getting out and enjoying the unique scenery of the frozen high Sierra region - no skis required! I hear Tioga Pass is even open.